I’ve been a bit behind in mentioning some of my published projects, and here are two I’d like to share with you. 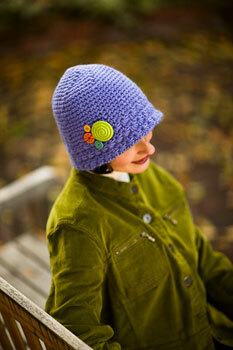 First up is the Candy Cloche (Ravelry Link) in Interweave Crochet’s Winter 2009 Issue. This hat makes use of a star stitch (or marguerite stitch) on the brim, and a few readers have emailed me who are a bit confused on how to make the stitch. Since there are several variations online, I’d like to point you to this free Star Stitch Tutorial on about.com, which makes the stitch in the same way that I did for this pattern. And fear not, in order to keep you (and me) from going nuts, there are only a few rows of star stitches at the brim of the hat and from there you can just spirals on up to the top. This design works really well in one-ply wool (that is, yarn that’s really smooth) as it will show off your handiwork Personally, I’d stay away from variegated yarns (at least for the brim) because they will likely hide your stitches, whereas lighter solid colors will really hilight the star stich. I actually really liked the yarn they sent for this one: Valley Yarns Berkshire Bulky (and, it’s very affordable!). I wish I had a reason to wear a hat like this, but I don’t as it’s 66 degrees outside today (and I’m not complaining!!). The rest of the issue is full of some great, gorgeous projects including a special emphasis on Tunisian Crochet. Can you believe I’ve actually never tried Tunisian? It’s something I’ll definitely have to try one day–the garments in this issue are so pretty. Next is a quick and easy Giant Granny Square Afghan (ravelry link) in Knit Simple (which hits newsstands tomorrow). If you are someone who dabbles in both knitting and crochet, Knit Simple is a great magazine that provides a little bit of each. Yes, it’s more heavy on knitted patterns, but, the designs in both crafts are truly simple, meaning that you can make them without too many tears. This issue has a few different patterns made using granny squares, just to show the different looks you can get with them, so if you’re interested in a quick blanket, check it out. 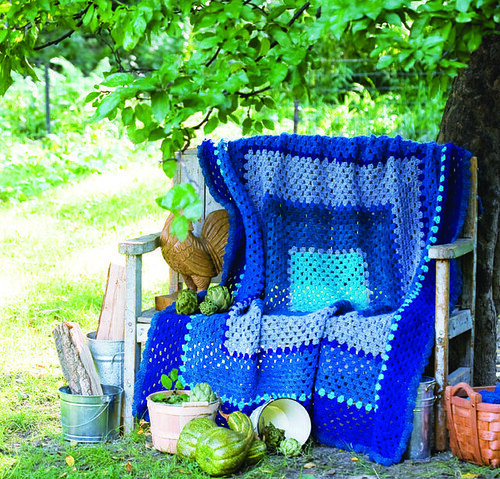 I crocheted this blanket with 17 skeins of Manos del Uraguay Wool in 5 shades of blue. I worked on this during the heat of the summer, which meant I got some quizzical looks, but I love the results. I also enjoyed dropping off the humongous box at Fedex, because it really didn’t weigh much for its size. What I did not enjoy was sending back the extra yarrn, Manos dyes their yarn beautifully and I wanted to make my own blankie too (but, that was when we still lived in Montana. See above note re: 66 degrees in January!). I still say the best Granny Square tutorial is the one you wrote for CraftStylish.com. Am teaching my first class Tuesday and for my students, I set up a whole page of helpful links on my blog. Thanks to you, they'll be able to get help long after the class. Thank you so much. Awesome I love them both and I have the Interweave magazine. You rock! Only just mastered 'normal' crochet! Loving your book btw... tunisian crochet hooks look mad but I absolutely love the effect. 66 degrees?! It's horrible in London. All the more reason to crochet a blanket!